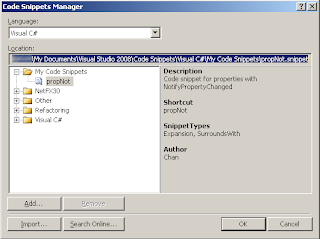 The Code Grimoire: Code Snippets in C# and Why my TwoWay Bindings are not working? Code Snippets in C# and Why my TwoWay Bindings are not working? Well, regarding to the problem with the TwoWay binding, today I’ve learnt that they don’t work magically; each property should implement the Property Change Notification, the INotifyPropertyChanged. It’s not that complex, It takes a little more time to declare the property this way (by the way, you have it perfectly explained here) and this leads us to the Code Snippets thing. Creating code snippets is one of those things I’ve left to learn later a lot of times… until today that I had to create an object with more than thirty properties launching the PropertyChanged event and I couldn’t delay it further. 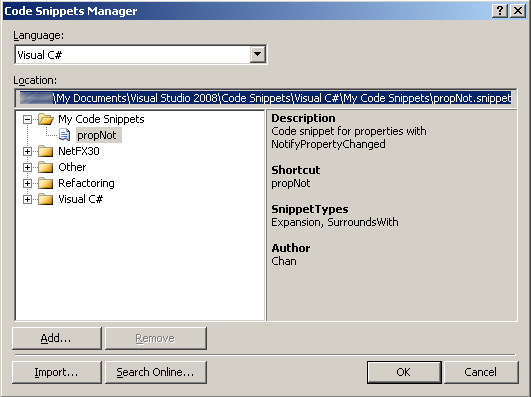 To do so, in Visual Studio, I went to Tools and from there to Code Snippets Manager. There I chose C# and then I copied the address of the My Code Snippets folder. It’s tested and working, both the TwoWay binding and the Code Snippet.